Buckminster Upholstery, Falls City, NE, was recognized with the 2013 International Achievement Award (IAA) for design excellence in specialty fabrics applications, that took place Oct. 24 at the IFAI Specialty Fabrics Expo 2013 and Advanced Textiles Conference & Trade Show, at the Orlando Convention Center in Orlando, Fla.
Buckminster Upholstery received an Award of Excellence for its 1890’s Turkish Couch project. The project was recognized in the competition’s Upholstery category. The International Achievement Awards competition is sponsored by IFAI, a not-for-profit trade association whose 1,800 member companies represent the international specialty fabrics and technical textiles marketplace. Kim Buckminster with Buckminster Upholstery has been in business for over 35 years and has won numerous awards for his upholstery work. 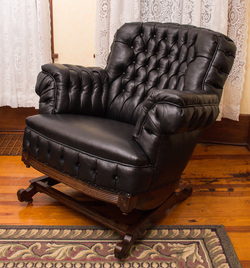 Specializing in traditional, restoration and general upholstery, Buckminster has provided his services for museums, government offices and clientele throughout the Midwest.